Small cushion-forming alpine with tight rosettes of lime encrusted, grey-green leaves. Peach-pink flowers in March and April. Porphyrion section, Kabschia subsection saxifage, Conspecta Group. 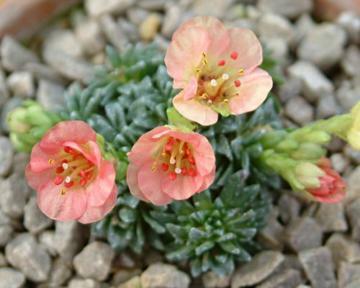 Hybrid of Saxifraga kotschyi x Saxifraga cullinanii 'Radvan Horny', raised by Karel Lang, Czech Republic.